Last December I traveled to Khentii Aimag with a few friends. We decided the countryside would be the perfect place to celebrate the New Year. 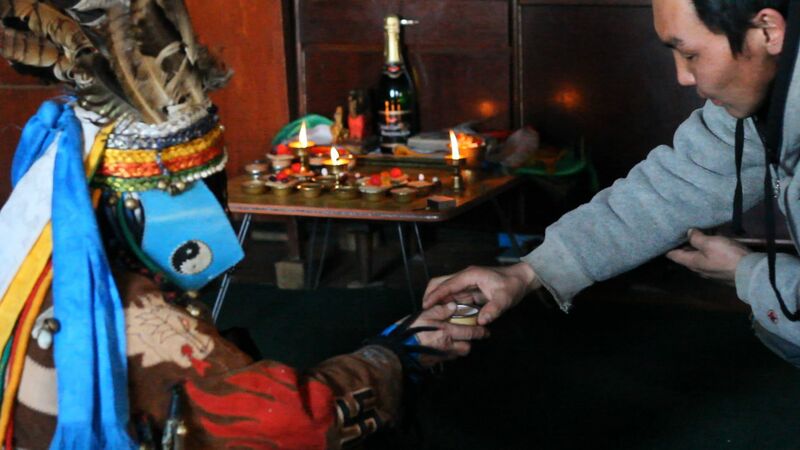 While there, we paid a visit to a local shaman, who lived a few kilometers from where we were staying. She invited us into her house, a one room log cabin typical for the region. We sipped on milk tea and nibbled on bread as she chatted with our guide and driver in Mongolian. I managed to film her while our guide asked her some questions. It wasn’t a real interview, as I didn’t get the translation until weeks later. After about an hour, she started preparing for the ceremony. With the help of her pregnant daughter-in-law, she set up a small table and placed several small brass cups on top. In the back row she placed five on the left to represent the fifty-five positive gods and four on the right to represent the forty-four negative gods. The large cup in the front was for the Earth Mother. She filled the cups with various substances including vodka, milk, dried cheese and yogurt, cigarettes, crackers, and candies. They set up a second table with vodka, milk tea, cigarettes, candies, a pipe, and some snuff. All of these ingredients were to be offered to whatever god possessed the shaman’s body. After all of the cups and food items were arranged, the shaman changed into her ceremonial garb, which included a silk pant suit, a large jacket covered in bells and ribbons, and a headdress that covered her face. She sat down facing the offering and began beating the drum and singing. After about ten minutes of increasingly intense playing, she collapsed to the ground. She was then helped to her spot on the floor, given some vodka and a cigarette, and the transformation was complete. For the next three hours, she spoke in a low and raspy voice (like that of an old man), chain smoking and drinking nearly an entire bottle of vodka. We each asked her questions about ourselves or someone we knew. It’s hard to tell how much was translated and how much was lost, but there were some enlightening parts. Three different spirits possessed her throughout the ceremony, and she would play the drum or jaw harp to call them each time. After all was finished, she beat her drum one final time, and it seemed to be over as quickly as it had come. She took off her head dress and coat as she regained her consciousness. The guide told us that she did not remember any part of the previous three hours and that the massive amount of alcohol she had consumed didn’t actually affect her. About a month later, I traveled to Khovsgol Aimag in the north to visit the Tsaatan (Reindeer People). They are known for their strong Shamanistic tradition and are widely believed to have the most powerful shamans in the country. I told one of the women in this community about the experience, and she seemed to think it might have been falsified. She said there’s a growing trend of tourist-centered shamanism that is not entirely authentic. She described some of their ceremonies, which can be unpredictable and last for the whole day. She said it could take an hour or two for the spirits to enter and leave the body, and the fact that it only took a few minutes for the Khentii shaman to become possessed was an indication that it might not be real. I also mentioned that she let me film the whole experience. She told me this was something a Tsaatan shaman would never allow. This being my first experience with a shaman, authentic or falsified, I have no basis of comparison. But even if it was a charade, it was a fairly convincing account of a very real and ancient practice, and thus, still very interesting. From the outside, all interior experience is mysterious. The false becomes authentic. The authentic becomes false. Thanks for sharing your experiences, Lauren.